How much are you in love? 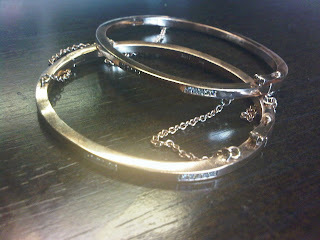 Solid Rose Gold bangles attached with chain and champagne diamonds. Can be yours for 8K. Made by Made Her Think. that is beautiful!! !i love it! I love it too! Maybe we can find a cheaper version somehow. I love the idea of the chains though. Too cute. Becky- No cheaper version available. I co-designed it!